Crews work on installing new traffic signals at the traffic circle at the bottom of Interstate 95's exit 24 as part of intersection improvements connected to the Metro Center train station project. Improvements to roads surrounding Fairfield's new Metro Center Railroad Station are nearing completion. "The intersections project is about 75 percent complete," said William Hurley, the town engineer. 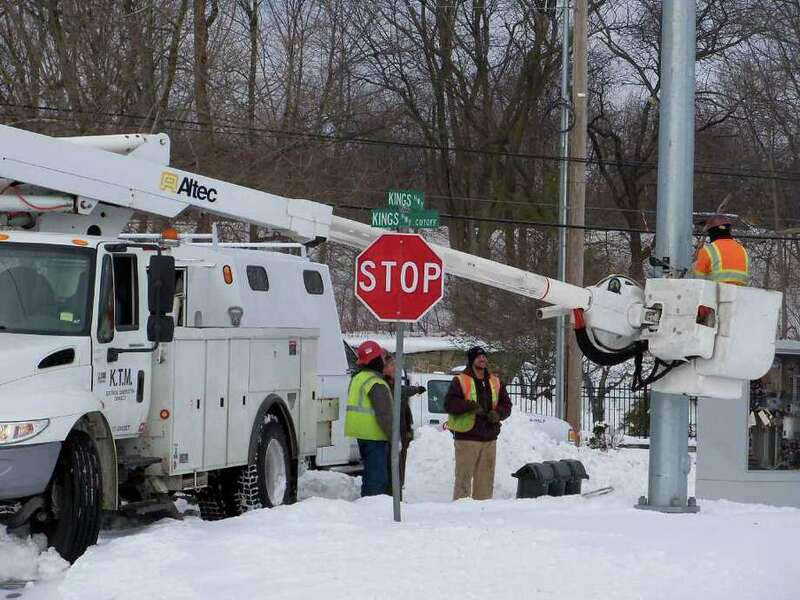 "Signal work, such as poles and signal heads are being worked on as we speak." Work at the busy traffic circle at the bottom of Interstate 95's exit 24 began last April, with the original goal of completing the job by December. Upgrades include adding traffic signals and eliminating some traffic lanes. For example, the "S" maneuver needed to get on to Johnson Drive and subsequently I-95 northbound will now be eliminated in favor of a right-hand turn, controlled by a traffic light. The new signals will be tested later this winter, Hurley said. "All the roadway improvements have been performed, with the exception of paving local roads that surround the station," he said. Those areas -- Kings Highway East and portions of Black Rock Turnpike and Grasmere Avenue -- are scheduled for late April. Funding for the $2.7 million intersection improvements comes from several different sources, including federal stimulus funds and grants from the state Department of Economic and Community Development. The work is being done by Guerrera Construction Co. of Oxford. The state Department of Transportation will provide $19.4 million to build a road through the station property on lower Black Rock Turnpike, construct a 1,500-vehicle parking lot and provide almost 10 acres of wetland and shoreland remediation. The town provided $4 million and Blackrock Realty, the private developer who bought the one-time foundry and brownfield from UPS, supplied $5.2 million. Blackrock had planned to build a multimillion-dollar commercial and retail development on the site before it suffered financial problems and went into foreclosure. Meanwhile, the state will decide by February whether to keep the "Metro Center" moniker for the town's third train station or possibly adopt the "Black Rock" name that received overwhelming local support in a recent online survey.